Make this stitch dictionary your constant embroidery companion! The Right-Handed Embroiderer's Companion: a step-by-step stitch dictionary will help you to learn and master over 170 embroidery stitches including their variations. With clear step-by-step instructions, accompanied by diagrams showing you what to do, it is very hard to go wrong. Examples of each stitch will inspire you to use them creatively and experimentally in your embroidery. Counted thread, needlepoint and surface embroidery stitches are carefully explained, with many helpful diagrams and photos. Because The Right-Handed Embroiderer's Companion is so easy to use and understand, you will gain the confidence you need to learn new embroidery stitches and create beautiful needlework. Click here for a turn-the-page preview of the book. Please note, if you are left-handed, we have a separate stitch dictionary just for you: The Left-Handed Embroiderer's Companion. The Right-Handed Embroiderer's Companion: A step-by-step stitch dictionary has 160 information-packed pages, with step-by-step instructions for over 170 embroidery stitches including their variations. We now have a new turn-the-page preview of 'The Right-Handed Embroiderer's Companion'. This preview requires Flash and may take a little while to load, but its definitely worth a look, as you will see the contents and layout style of the book. A comprehensive range of surface stitches, counted thread stitches and needlepoint stitches including: antwerp edging, armenian edging, back, basque, braid edging, breton, bonnet stitch, bullion knot, buttonhole, cable, cable chain, cable plait, cast on, ceylon, chain, chevron, chinese knot, colonial knot, coral knot, couching, cretan, cross, diamond, diamond upright, drizzle, eyelets, feather, florentine, fly, four-sided, french knot, glove, gobelin, hedebo, hem, herringbone, hollie, jessica, long and short, loop, montenegrin, mountmellick, mountmellick thorn, needleweaving bars, norwich, nun, palestrina knot, parma, pearl, pin, plaited braid, queen, raised fishbone, rhodes, rope, rosette, running, satin, scottish, scroll, seed, sheaf filling, shisha, smockers' knot, split, spider web, stem, tent, thorn, trellis, turkey work, vandyke, wheat ear, woven picots... and many variations of these embroidery stitches! With our clear step-by-step instructions you will quickly feel that you can master almost any embroidery stitch. No more searching for stitch diagrams on the internet or in books, as it is all right here in The Right-Handed Embroiderer's Companion. This is a stitch dictionary that makes it easy to learn all you need to know, and shows you exactly how to do it. 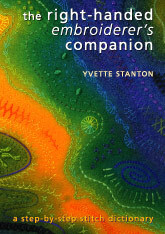 Yvette Stanton is a respected Australian embroidery teacher and award-winning needlewoman. Following the success of The Left-Handed Embroiderer's Companion, she learned that there was a new condition called 'left-handed envy'! She found that right-handers were jealous of the clear instructions and inspiring nature of the left-handed stitch dictionary. This book is to redress the imbalance and keep right-handers happy! "I had been thinking of doing a stitch dictionary for some time, as through all my classes and previous books, I had quite a collection of stitches already written out in step-by-step style, with all their diagrams. It made sense to do the left-handed stitch dictionary first, as there was a huge gap in the market for a comprehensive left-handed stitch dictionary. But it was so popular that right-handers wanted their own version of that stitch dictionary. So here it is!" Yvette has written books on Hardanger embroidery, merezhka embroidery , Mountmellick embroidery and Portuguese Whitework. Yvette teaches at shops around Australia, and is an accredited tutor with the NSW Embroiderers Guild. The diagrams are really clear and along with the clearly written instructions it is almost as good as having one-to-one tuition. Acon "Crafter"
Order your copy of this fabulous stitch dictionary by Yvette Stanton, today. With such clear step-by-step instructions, you'll be mastering new stitches in no time. And that stitch that you've always had problems with? This stitch dictionary will help you to sort out all those problems! It should be every (right-handed) embroiderer's constant companion. The Right-Handed Embroiderer's Companion: A step-by-step stitch dictionary is the must-have stitching companion. You will refer to it again and again.